Eat better. Go to the gym. Spend less money. Get up earlier. Oh, first week of 2012, you're breaking our hearts! Seriously, I want my vices back. 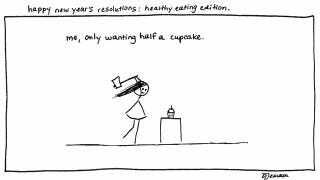 Can't wait until next week when New Year's resolution season is over and I can start eating entire cupcakes and throwing money out the window again.